Last year, you might recall, I was a little disappointed at the relative lack of crime, mystery or thriller fiction titles, New Zealand or international, in the annual 100 Best Books list put out by the New Zealand Listener magazine. Especially as there were several very good crime novels that came out, and despite its literary leanings, the Listener had listed crime novels, including New Zealand crime novels, in the past, such as those of Paul Cleave and Vanda Symon. As I said last year, the New Zealand Listener has long been considered one of our premier magazines. It is a weekly current affairs and entertainment magazine, renowned for having one of the best books sections around. 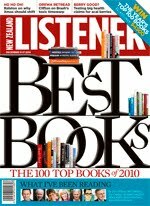 Near the end of each year the Listener has a “100 Best Books of the Year” issue, where its reviewers compile their list of best novels, short stories, poetry, biography, memoir, and other non-fiction (eg history, science, journalism and essays, art, and food and drink) books of the year. Some cracking books there, and hopefully more Kiwi readers might give some of them a go, after reading about them in this week's issue of the Listener. Congratulations to the Kiwi crime writers who made the list. Have you read any of the crime novels mentioned? If so, what did you think? If not, which ones catch your eye? Thoughts and comments welcome. Fantastic to see the NZ crime fiction featuring on the list! I must track down the Belinda Bauer novel - it's had great reviews, some summer reading. Is Andrew Porteous' new novel available in NZ? I read "The Reversal," by M. Connelly--good, a legal thriller plus police investigation. Connelly is a brilliant guy, no doubt, knows the law inside and out, and Harry Bosch is still keeping on. Hadn't heard of most of the other books, except Bauer's, but will research them.